WASHINGTON (CNN) -- The State Department issued a report Wednesday sharply critical of China's human rights record, despite the Obama administration's decision to take a different approach to the Asian country. 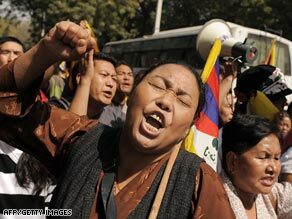 In India on Wednesday, Tibetans living in exile protest Chinese rule in Tibet. "The government of China's human rights record remained poor and worsened in some areas," the report said in reviewing the last year, finding Chinese authorities "committed extrajudicial killings and torture, coerced confessions of prisoners and used forced labor." The "2008 Country Reports on Human Rights Practices," the annual report of human rights around the world, also accused China of "severe cultural and religious repression" of minorities in Tibet and other regions and increasing harassment and detention of dissidents and activists who signed a petition calling for respect of human rights. China limits the rights of citizens to privacy and freedom of speech, assembly, movement and association, the report said. It also noted that abuses peaked around high-profile events like last year's Olympic Games in Beijing. The critical report stands in sharp contrast to the lower-key approach Secretary of State Hillary Clinton took last week on her visit to Beijing. Clinton broached the issue of human rights with Chinese leaders, but drew criticism from human rights activists for downplaying the issue's importance in the overall relationship with China. "Our pressing on those issues can't interfere with the global economic crisis, the global climate change crisis, and the security crisis," she told reporters traveling with her, adding, "It is essential that the United States and China have a positive, cooperative relationship." In the past, Clinton has been an outspoken, staunch critic of China's human rights stance. But officials have said privately that a new approach to dealing with China's human rights record, including less public criticism and more private discussions, may prove more productive in changing Chinese behavior. While not delving into U.S. human rights practices, the report acknowledged that the U.S. human rights record remains a concern around the world, and it said President Obama has vowed to apply global human rights ideals at home. "The Department of State remains mindful of both domestic and international scrutiny of the United States' record," the report said. "We and all other sovereign nations have international obligations to respect the universal human rights and freedoms of our citizens, and it is the responsibility of others to speak out when they believe those obligations are not being fulfilled."